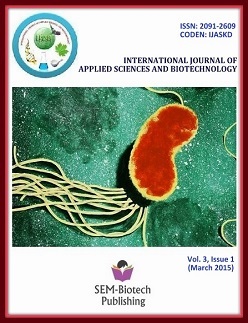 A study was undertaken to analyses the heritability, correlation and path co-efficient for growth and fruit characteristics in fifty seven okra(Abelmoschus esculentus Lam) genotypes grown at Plant Genetic Resources Centre, Regional Agricultural Research Station, BangladeshAgricultural Research Institute during kharif season of 2013. The highest range of variation was recorded in average fruit weight (18.25-25.41g), followed by yield per plant (98.90 – 1650.00g). The highest GCV (46.70 %) and PCV (47.72 %) were recorded for fruit yield perplant while both were lowest for days to maturity (8.07 % and 8.25 %). High heritability coupled with high or moderate degree of geneticadvance was estimated in plant height (99.82 % and 205.06), number of fruits per plant (99.53% and 203.63%), number of leaves per plant(99.57% and 204.49%), number of seeds per fruit (99.73% and 205.44%), leaf length (98.22% and 198.52%), leaf diameter (98.91% and203.76%), 100-seed weight (98.12% and 202.13%) and yield per plant (95.76 % and 197.26%). The highest positive correlation were observedbetween number of fruits per plant and yield per plant (r = 0.99**) and between number of fruits per plant and 100-seed weight (r = 0.44**).Also results showed that significantly positive correlation were between 100-seed weight and yield per plant (r = 0.44**), 100-seed weight andleaf length (r =0.42**), 100-seed weight and leaf diameter (0.38**), number of leaves per plant and 100-seed weight (r = 0.28*), 100-seedweight and plant height(r =0.40**), 100-seed weight and fruit length (r =0.28*). Significantly positive correlations were also observed for plantheight and number of fruits per plant, number of leaves per plant and yield per plant. The path coefficient analysis was done to determine directand indirect effects of traits on fruit yield. Direct significant positive and negative effect of number of fruits per plant (-0.091), 100-seed weight(0.174), number of seeds per plant (-0.213), average fruit yield (-0.310) towards yield.